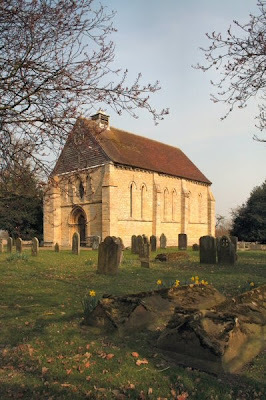 A bright sunny day so just the job for going into Kirkstead to look for the church. It is only a few hundred yards from the canal according to Nicholsons. Thank goodness they didn’t say a few miles. It turned out to be a ten day camel hike – OK I exaggerate slightly but it is more than mentioned. 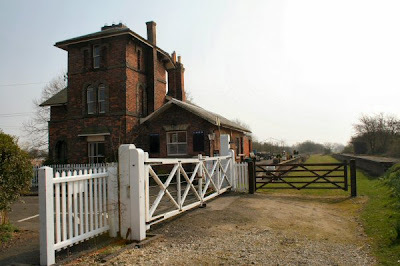 To get onto the street you have to walk passed the old railway station of Woodhall Junction. The crossing gates are closed and all ready for the train that never comes. There are no signs for the church. 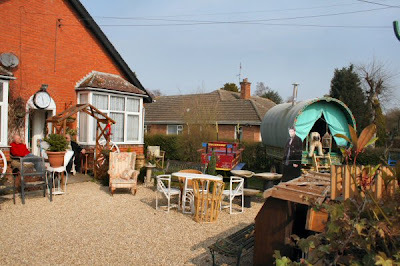 Finally you come to Abbey Lane and I noticed a gypsy caravan in a garden with a couple of gentlemen sat outside enjoying the sun. I asked about the church and was told it was passed the abbey – can’t miss it. Stayed a moment to chat and according to them they are Woodhall Spas answer to the Last of the Summer Wine. A tale they told me was of a friend of theirs who used to have a narrowboat and ended up marrying a 17 year old. He died shortly afterwards but he did a lot of smiling before he went. Walking down the lane and there are a couple of building with stone that could easily have come from the abbey. 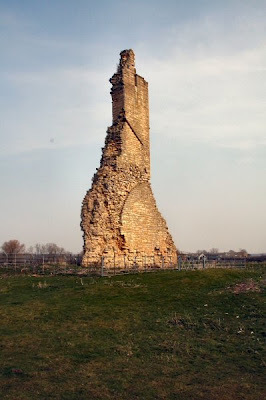 There is not a lot of the abbey left these days. There is just the one stump standing 30 foot high in the middle of a field that is totally covered with humps and bumps. Where is Time Team when you need them? But at least you can now see the church. The church is rather nice from the outside with some slate grave markers and many covered in lichen. Sadly that is all you can see for it is locked as are most churches these days. On the walk to the church one sees all the signs that sping is here. The celandines are out and I well remember clutching a posy of them at the age of 5 as a present for my grandmother in Wales. It took me 30 minutes to walk back to the canal so I would imagine that it is at least one and half miles away. A nice walk for all that. Leaving Woodhall for Tattershall and the banks are as high as ever. However the river starts to behave like one with lots of bends to keep one occupied. I looked out for the abbey but didn’t get a sighting of it or anything else. RAF Coningsby isn’t far away as you can hear the aircraft winding up ready to go. I am sure that at one point I could smell the burning fuel. 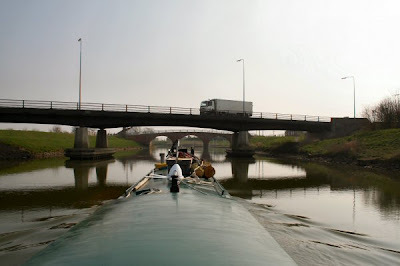 Around a bend and Tattershall Bridges comes into view. The old bridge is on the other side along with the moorings. From the mooring the view of the old bridge is vastly superior to the view in the other direction. 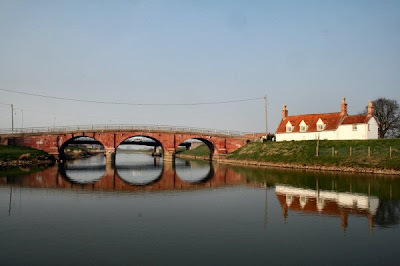 Chatted to a lady who has friends in Louth and every time she and her husband visits them they stop at the bridge for a cup of tea and enjoy the view. I was encouraged to read my bible more. In that department I am a lost cause. Shortly after mooring up a couple of barges paired up came along. 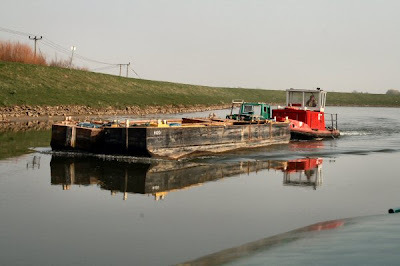 The Waterways tug Kingfisher was be taken along by a firm from Doncaster. Probably been working in Boston as there has been a tremendous amount going on there to link into the drain system towards Spalding.